Yesterday I was looking for a quick dinner that would not involve much preparation as I needed to work in the evening some more. My family was getting one of their favorite meal: Pasta Carbonora and since I was cooking two dinners ( mine and theirs), I thought, why not utilize some of the same ingredients for my dinner. 1 bag of frozen large shrimps uncooked with tail on thawed out. 1 pack of spaghetti of 14 oz. To thaw the shrimps, remove the bag of shrimps from the freezer and place it in the fridge overnight. If you don’t have that time, place the bag in warm water and shake the bags every so often. The shrimps will thaw within 15 minutes. Remove the shrimps from the bag, place them in a colander and rinse them. With a few paper towel, dry out the shrimps and place them into a bowl. Add 2 tbsp of olive oil, 1-2 tbsp of the green onion and pepper herb blend from Demarle, 1/4 tsp of salt, 1/18 of pepper and mix well. Cover the bowl with the octogonal silpat or a plastic wrap and let the shrimps marinade 30 minutes to 2 hours. 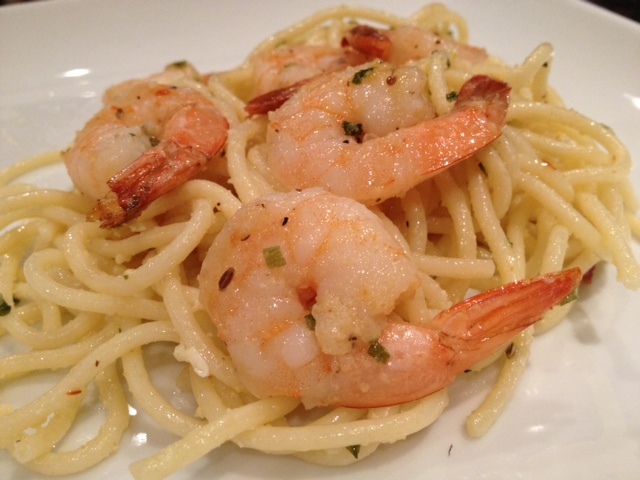 While the shrimps are marinating, prepare the pasta. Fill up a large pot with water, add 2 tbsp of salt and bring to boil. When the water is boiling, add the pasta and cook for 5 minutes or until al dente. Remove the shrimps from the oven and lay them out on a large silpat that you would have placed on a large perforated sheet. Cook for 7 minutes. When the pasta is cooked to your satisfaction, drain the water from the pasta. Add 1 tbsp of olive oil, 1 tbsp of green onion herb blend from Demarle and stir. 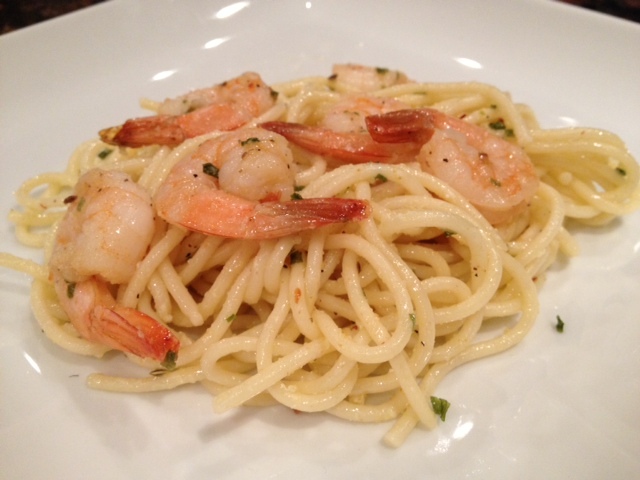 To serve, spoon the pasta on plates and place a few shrimps atop the pasta. Add fresh grated parmesan or romano, Et voila!